If you’ve been around e-learning a little while, chances are you’ve heard of the ADDIE model, the most commonly used instructional design model and the go-to process most training designers use when crafting learning experiences. The acronym stands for Analysis, Design, Development, Implementation, and Evaluation. 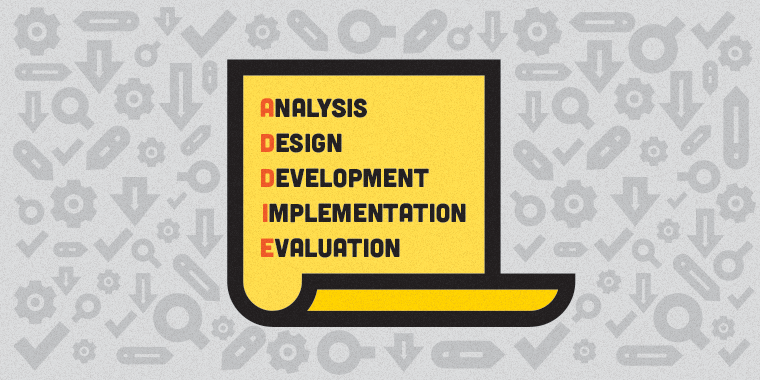 If you’re designing training or e-learning, it’s important that you have a solid grasp of what ADDIE means. The five steps that give the ADDIE model its name are the steps you should follow to create training from start to finish. Now you might be wondering, Why should I follow this ADDIE process? The reason is simple: The ADDIE model, which has been in use for more than 30 years, provides a logical, step-by-step “roadmap” for building training that ensures learners will have to meet specific objectives. New designers have a tendency to want to jump directly into “development” (I totally get it; that’s the fun part! ), but they need to be careful not to skip steps, because each one is critical. Let’s take a closer look at what each phase of ADDIE entails. Training Needs Analysis: This should be the first type of analysis you complete because it identifies whether the training is needed at all. This analysis identifies what performance improvements are expected and how they will be measured, which is critical in identifying whether training has been successful. Read more: How to Do an E-Learning Needs Analysis. Audience Analysis: Once you validate that the training is indeed needed, it’s time to analyze your learners. Knowing key demographics and background information about your learners will help you identify the information they need to know and the best way to present it to them. Read more: How to Do an E-Learning Audience Analysis. Task Analysis: Now that you know what your course is about and who will be taking it, it’s time to take a close look at the specific processes and tasks you’ll be training learners on by breaking them down into step-by-step chunks. Read more: How to Do a Task Analysis Like a Pro. Once you’ve completed these analyses, you have a much better idea of the who, what, where, and why of your e-learning. A good idea is to compile these findings into your first deliverable: a project plan. Read more: How to Plan E-Learning Courses Like a Pro. Storyboard: This document lays out the elements of the course that will appear on each slide, including the text, imagery, and narration script. Exactly what’s included in a storyboard depends on the project. For example, if your project includes audio narration, you’ll need to add a script to your storyboard. If you’re building a storyboard that you will hand off to a developer, you’ll need to add detailed notes for the developer. Read more: Storyboards for E-Learning: What to Include? Prototype: This is typically a model or sample of a course that is created to test and identify whether specific features or concepts work. The prototype lets a stakeholder get a feel for how the course looks and functions before developing the entire course and all of its features. Read more: E-Learning: Storyboard vs. Prototype. Once you’ve got your blueprint for your course, you’re ready to jump into the fun part: development! Content Creation: In this phase you choose and add the final graphics, multimedia, colors, and fonts to make your course look polished and professional. You’ll also use your authoring tool to build out activities, quizzes, interactions, and functional navigation to create an engaging course. Read more: Overview of E-Learning Authoring Software. Testing: Once you’ve created your content, you need to test it. Things that need to be tested and reviewed include spelling, grammar, learning objectives, navigation, and flow. Testing is typically done during the development process instead of after, so that as testers identify problem areas, the developer can make changes to the final product. Read more: Top 3 Tips for E-Learning QA Testing. Once your course is fully developed and thoroughly tested, you’re ready to share it with your learners. Typically, during the Implementation phase, the materials are shared in one of two ways: by uploading it directly to the web or to a Learning Management System (LMS). How do you decide between these two implementation methods? It depends on whether you need to track and report on learner behavior. Web: If you don’t need to track learner behavior, you can upload content directly to the web and provide a URL link for your learners to access the training. However, since learner activity isn’t tracked, you won’t know whether they completed the course, how long it took them to do so, or if they went wrong somewhere. Read more: How to Get an E-Learning Course Online. LMS: If you do need to track your learners and their progress, your best bet is to share your content through an LMS. Every LMS offers different features and functionalities, but they share some tracking capabilities, such as whether learners completed a module and how long it took them. Read more: An Introduction to LMSs. When you progress to the evaluation phase, you need to go back to the very first step of the ADDIE process, in which you (hopefully!) completed a training needs analysis. During that step, you identified specific performance improvements that your training would address as well as how to measure those improvements. The evaluation phase is where the rubber meets the road: Did your training result in the real, measurable performance improvements you identified in your needs analysis? While the learner’s opinions and feedback about the e-learning matter, it’s most critical to ensure that your training achieved the goals you set at the start. Read more: Post-Course Evaluations: What E-Learning Designers Need to Know & How to Measure the Satisfaction of Learners Taking Your Online Courses. Scrum is not really a model itself (nor is it an acronym). It's a type of meeting used in the Agile process. It's named after a scrum in rugby. Like a rugby scrum in many ways, it's a meeting where the entire team comes together daily and they hold the meeting standing up to help keep it short, then everyone breaks up and goes back to "moving the ball." i prefer the Successive Approximation Model that is described in Micheal Allen's "Guide to eLearning." The way it is described, it seems more fluid than ADDIE as long as you have the people you work with buy into the method. Thanks for sharing your input, Terry! Terry, I like what Michael Allen does in terms of eLearning courses. Allen Interactions develops some cool Flash based and HTML5 courses. However, I just don't know that SAM is a replacement for ADDIE. Dr. Allen is borrowing the concept from B.F. Skinner to established the Successive Approximation Model (SAM) by training rats with conditional behavior tactics. I read the SAM book and didn't found any research evidence substantiating its effectiveness. ADDIE has been corroborated in various studies as a viable process, the problem is most folks in the industry don't really know how to apply it for their needs and thus given it a bad rap. Pretty much the same thing that happened to PowerPoint as a presentation software LOL. What are your thoughts about where and how the Agile Method plays into all of this? You can't really apply ADDIE and Agile together in the same project effectively. They have to many contradictions of each other in the way they're applied. This is the best intro to ADDIE I have ever read! In fact, I just discussed ADDIE with a new Instructional Designer at my company and used a lot of the same verbiage and examples. Well done! I did add some commentary to my discussion so that we discussed SAM. I explained that, I personally work hard to keep my clients in a constant feedback loop and I will repeat A-D-D phases like iterations until I am ready for I-E phases. As a final comment; I would like to agree about Power Point having a bad wrap. It IS about the talent of the designer and not the price of the tools. Great points, Angie. I really like your point that if you have a good, solid instructional designer, it doesn't really matter what tools you're using. Under Develop > Testing you could also add Accessibility (Section 508) testing. This is required by many projects. This is a big area that can eat up a ton of time and resources if not planned for and implemented correctly. Great point, Mike. And you mention planning for it. That means it's not only something to consider under development and testing but even during design. In fact, if you have government customers, it can even be part of requirements analysis.